It’s been a while since I read this so I went back to my notes and finally had to stop. The book just wasn’t worth all that much time and effort. 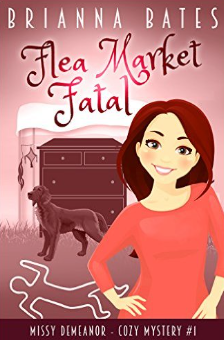 Flea Market Fatal is the first in a series which just astonishes me because Missy DeMeanor is one of the most annoying characters I’ve ever read. Missy is a shining 20 watt bulb in a 100 watt world at times, when Tyler questions her after looking at the dead man, “Missy couldn’t believe he was really asking her these questions. She looked into those blue eyes she had once found so gorgeous but now found so cold. She was amazed this was the same man she’d dated almost twenty years ago. He was a totally different person.” I’m not certain what is dumber, her not believing he would question her presence at the scene or her amazement that he had changed in twenty years. Just because Missy acts like a 15 yr old at times doesn’t mean everyone else should be as emotionally immature. Of course she shouldn’t feel so alone because the EMT who shows up at the scene keeps trying to get Missy to go on a date with him while waiting to take the body away. He’s a definite winner. The hero, Tyler Brock, has returned home to work on a small town police force and is not the most professional cop on the block. He seems to switch from professional to somewhat flirty personal at the drop of a doughnut, ““Was there anything else you wanted to ask me?” she said. He was still smiling. “A lot, actually. But none of it would be appropriate right now.””, and doesn’t seem to have a problem detaining someone overnight on the strength of a 20 yr old feud and no solid evidence. “Tyler nodded. “I didn’t want it to come to this, but you gave me no choice.”” He says this to Missy as he takes her mother into custody. Um, since her mother was the one trying not to tell him anything why was it Missy’s fault? Going back and rereading my notes I realize how negative this book is and how, well, dumb. “If the police think you did or they think they can close the case by pinning it on you, they will. Cops don’t like open murders on their books, especially in a small town like this.” And since Missy and Tyler dated in high school, “And the more she thought about it, the more Tyler had to suspect her. If he didn’t think of her as prime suspect, people would say it was because of their prior history. His credibility as a police officer would be shot. He almost had to come after her to stay above reproach.” No, if he is that close then he needs to hand over the case to someone else. I think the author really needed to do a little more research on police procedure. Continuing with the negative mood of the book, “Once upon a time it had been a typical store with all the new releases and bestsellers but about a decade ago, it had shifted models and become a used bookstore. All the volumes were dusty, the pages yellowed, and most of the spines of the paperbacks were cracked.” It’s a wonder this shop is still in business. I frequent used bookstores and they are dust free with a large inventory of solid spined, white paged books. Yes, there are older books whose pages are ivory with age but even those are dust free. There were some hiccoughs in the writing such as, “Without even realizing it at first, Missy put a hand on my belly. It was hanging over my jeans a little bit too much.” and “Her russet fur breezed as she raced to meet Missy.”, but these didn’t bother me as much as the annoying characters, their illogical behavior, and unrealistic actions. If you want a cosy that bears any resemblance to normal this is not the book for you.